As frequent travelers, we love buying and sending postcards and we were very excited to hear about a new service called Lettr. 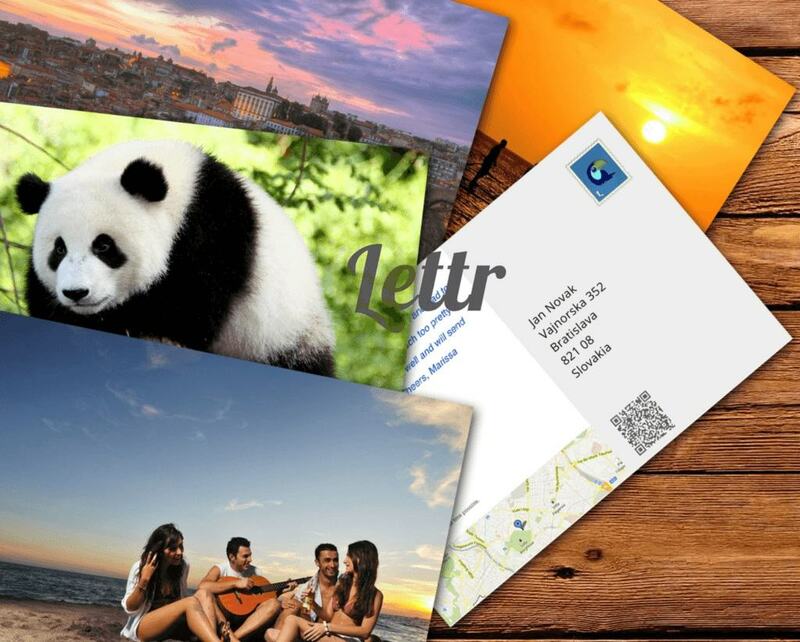 Lettr allows you to create custom postcards online that are then mailed to anyone worldwide. While traveling, we love sending postcards from awesome locations with short notes to people back home to let them know we are thinking about them. But as much as we love the perfect photos on the front of postcards, we have wished before that postcards could be a bit more personalized. Lettr is a new online service that solves this issue by allowing you to take and use your own photo for the postcard. So instead of sending your mom a postcard of the Eiffel Tower, you can send your mom a custom postcard with you in front of the Eiffel Tower! While you customize the postcard online, a printed postcard is still mailed to your loved one, allowing you to skip all the hassles of buying a postcard, paying for postage, and mailing a postcard. Interested? 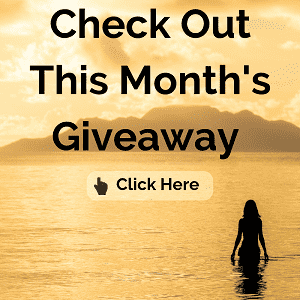 Read on to hear more about Lettr, read about our experience testing out the service, and enter our giveaway to try out Lettr yourself for free! Lettr is an online service that allows you to send customized real paper postcards to anyone in the world from your phone, tablet, or computer. 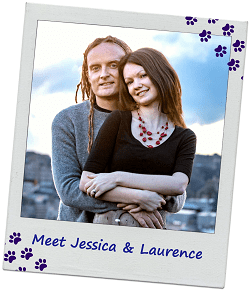 All you need to do is upload your own photo, write a message, and fill in the recipient’s contact information. After you upload your information and make a payment, the postcard is actually printed on postcard-quality paper, stamped, and then mailed to your loved one. 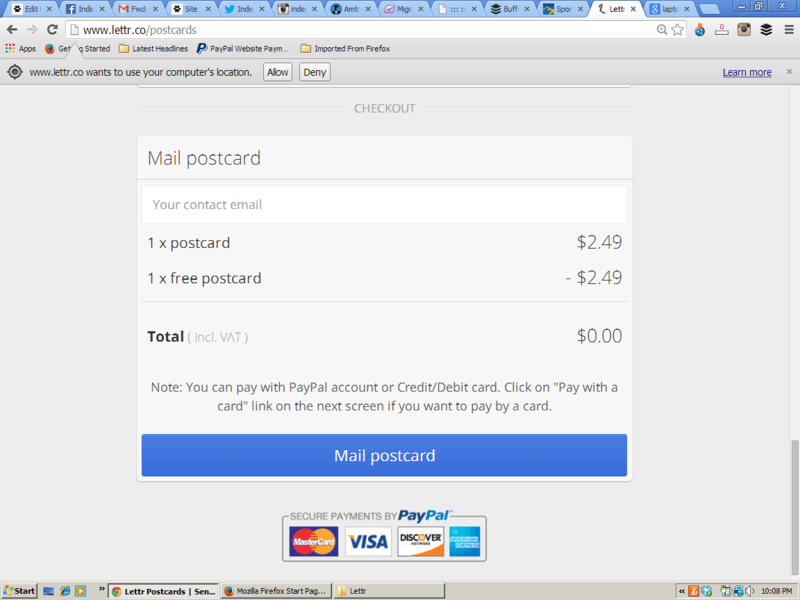 Currently, it costs $2.49 per postcard. The postcard can be sent to any valid mailing address worldwide for the same price. This step is super easy if you take the picture with your phone. We used a camera on our recent weekend trip to San Francisco, so we then just uploaded it to my laptop. 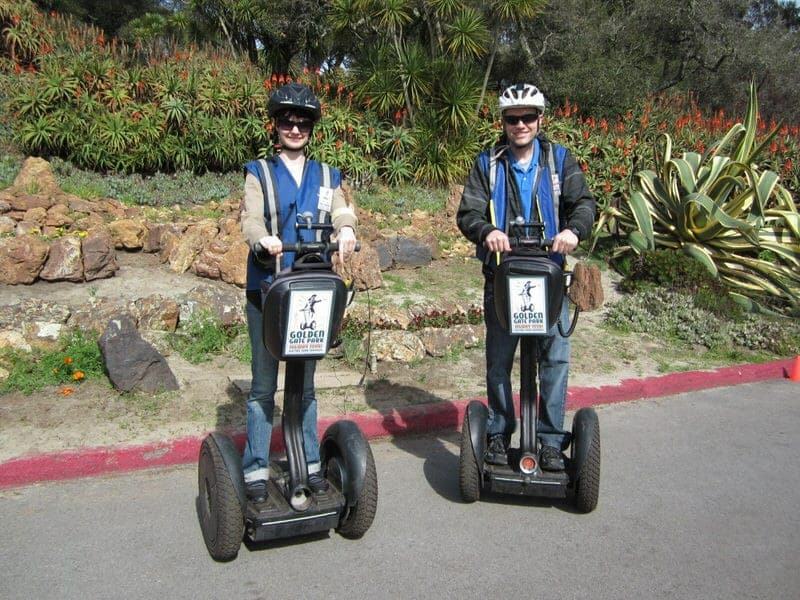 Below is a picture from our recent Segway adventure in Golden Gate Park. 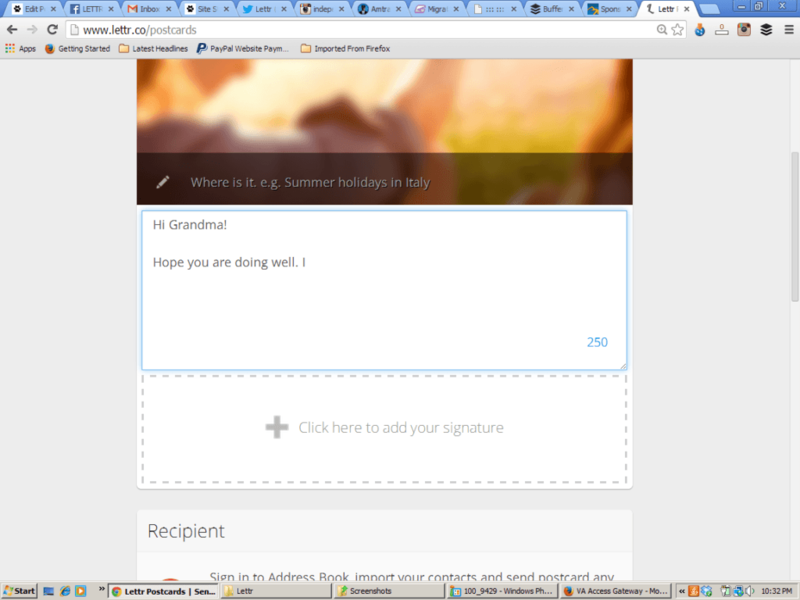 Just click the little yellow pencil icon in the top right corner on Lettr.co to get started customizing your postcard. 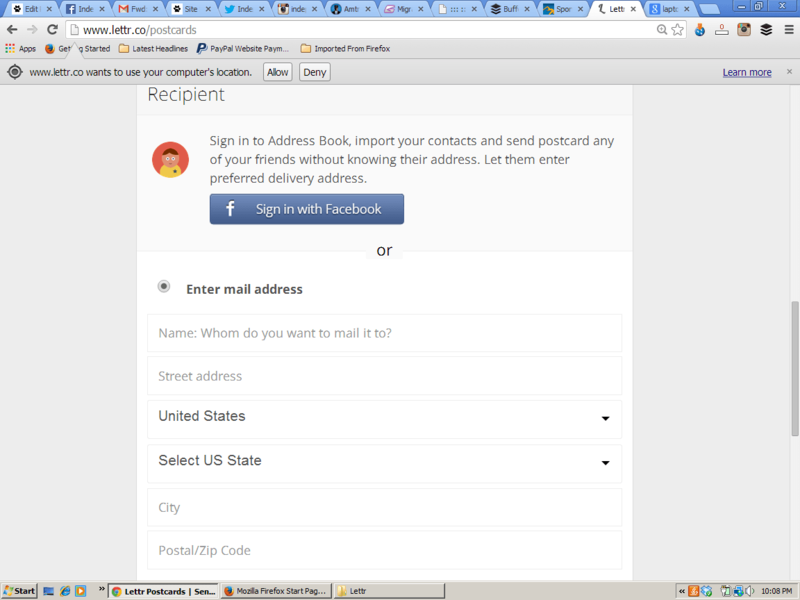 You can also sign in via Facebook, but you don’t need to do so. 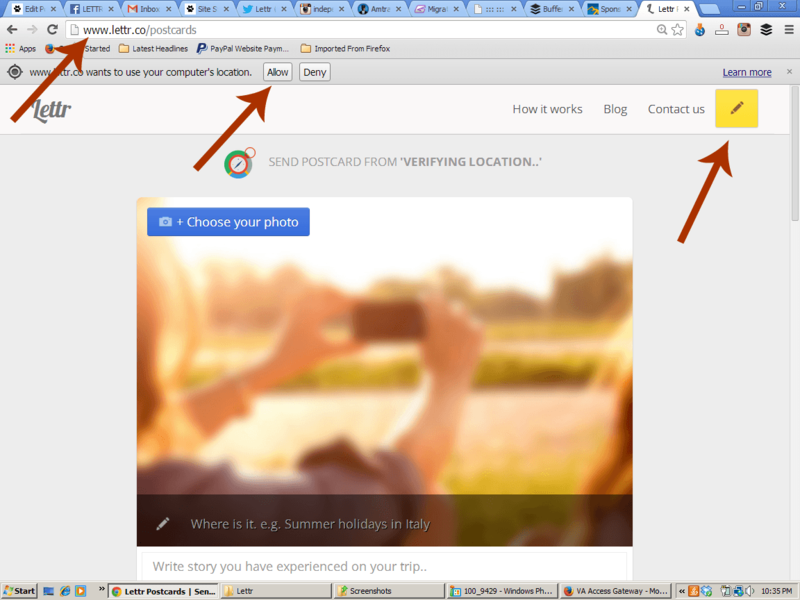 Depending on the Internet browser you use, your browser may ask if it can verify your location, the Lettr service uses this to help create your postcard so just click Allow. The system is pretty flexible about the size of the photo you upload and it will just resize it to fit the area. You can upload a photo that is in portrait or landscape orientation, but it will just show what fits into the frame. One minor issue is that you can’t adjust the frame, so you can’t decide which part of the picture is showing if the photo is too big for the frame. Don’t forget to put in a caption of where the photo was taken! You can write a message that is up to 250 characters in length. You can add your own handwritten signature using your mouse or your touchpad. 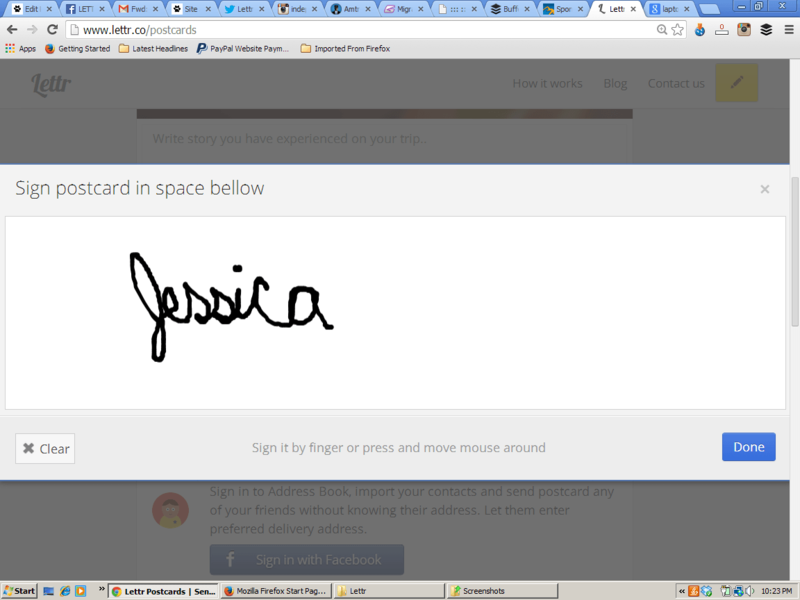 I just signed mine using my finger on my laptop’s touchpad. If you know the recipient’s contact information, this is simple. But if you don’t, you can sign into Facebook and select the person from your Facebook contact list and a message will be sent to your friend or family member asking them to provide their preferred mailing address. Later, once the person provides his or her address, the postcard will be mailed. 7. Make your payment and send it! You can pay using Paypal, a debit card, or a credit card. Then just click “Mail Postcard” and away it goes to be printed, stamped, and mailed to your loved one! Delivery times will vary depending on where you are sending it but Lettr is hoping to get all delivery times down to 3-6 business days. 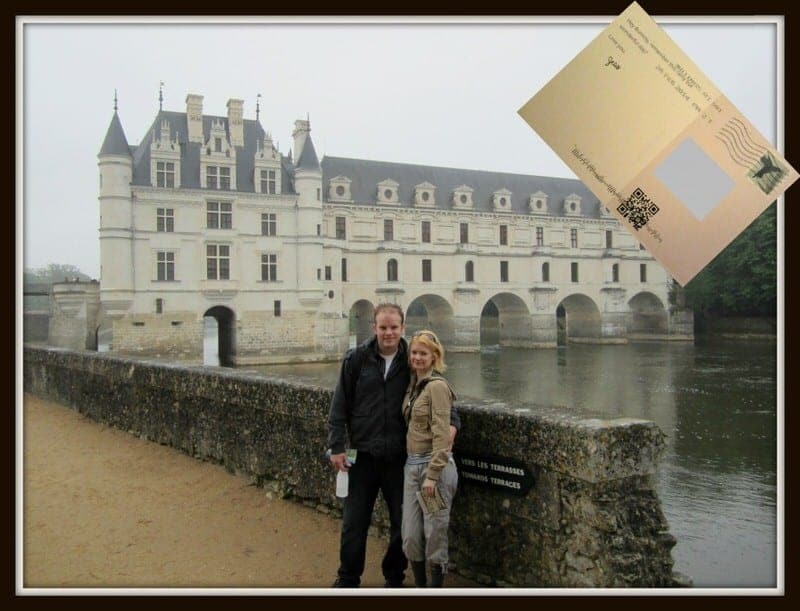 Using Lettr to send our custom postcards was a super easy process. 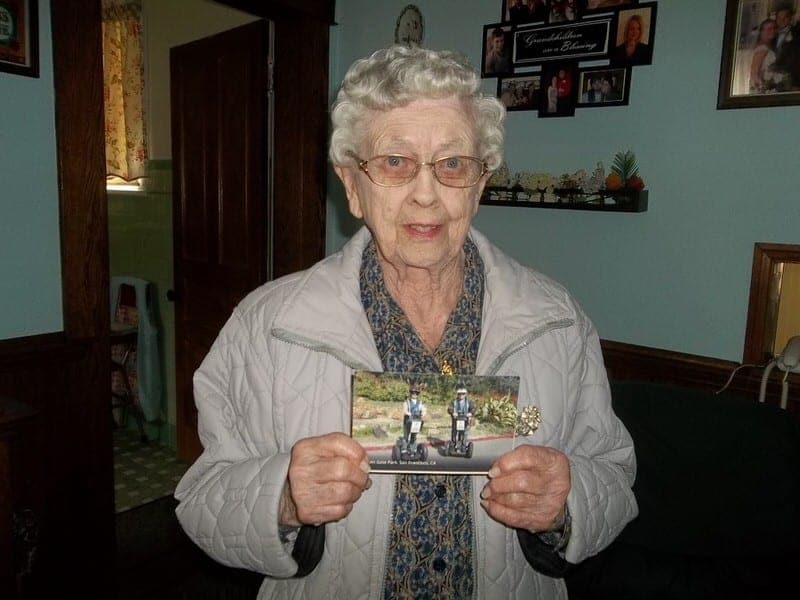 It took us about 10 minutes to send our first postcard to my grandmother (as shown above). 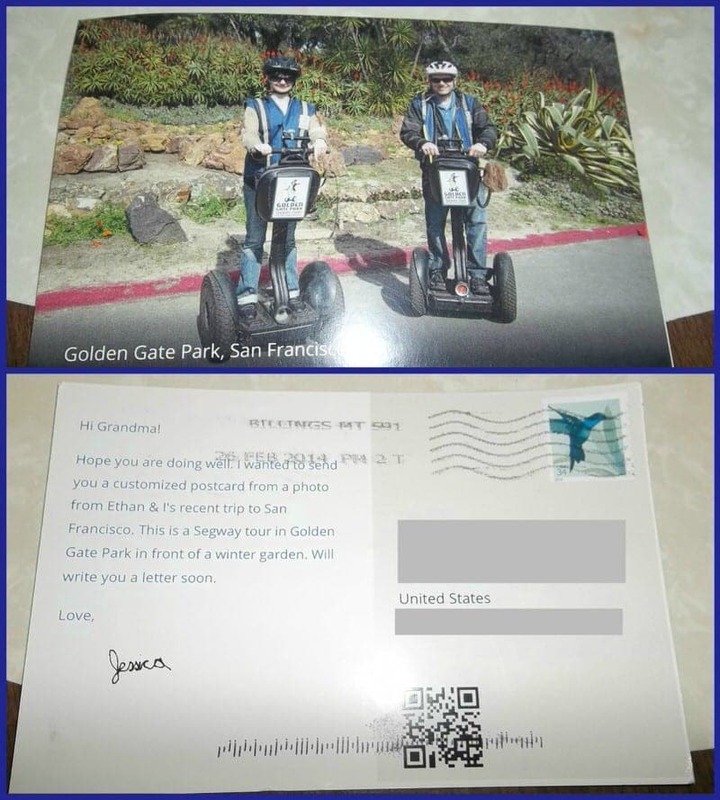 I also sent a second one secretly to Ethan as I wanted to check out a printed postcard firsthand as my grandmother lives on the other side of the country. The second time using Lettr it only took me about 5 minutes to send the second postcard as I already knew the system and what to expect. Both of the postcards arrived as promised with good quality printing and card stock. Best of all they showed my grandmother and Ethan that I was thinking of them! Lettr is a new company and is still working on adding more information to their website, adding new features, and making the service even better. We have been partnering with Lettr for over a month now and in that time they have already made quite a few changes to their website, such as adding the Facebook functionality. They have been super responsive when I have had questions and seem very receptive to feedback. 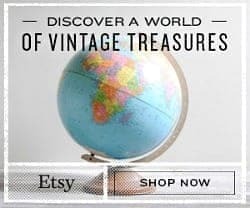 For instance, they are currently gathering more data on real-time delivery worldwide to add to their website and are trying to ensure postcards are getting mailed and received in a timely manner. So if you have comments, questions, or suggestions, I would not hesitate to contact them. Reasons we recommend using Lettr: 1) easy to use online interface, 2) can create personalized custom postcards, 3) saves time by not having to buy a postcard, get postage, or find a mailbox, and 4) has good customer service. While I still love old-fashioned postcards, I do think I’ll be sending a lot more using Lettr as it is just so much simpler and allows us to really personalize and customize our postcards. If you are in a place that doesn’t have postcards or just want to send a postcard of something wacky or mundane, it’s no problem with Lettr. These are definitely the postcards of the 21st century! Lettr has graciously provided us with a total of 10 free postcards to give away to our readers. Two winners will be chosen and will receive a link code that will allow them to each send 5 FREE postcards! So what do you think about Lettr? Have you used it, or do you think you would use it to send custom postcards in the future? Does this service still exist? 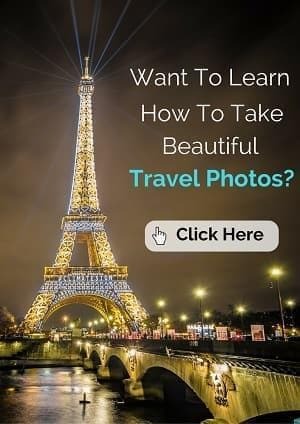 I clicked on the link but their website seems to be advertising city guides not postcards now. Hi Kate! Good question as I just checked their website and it seems they are now making city guides. I will contact them and find out and come back and post the results. It is a shame if they stopped doing the personalized postcards as I really loved this service. Hi Kate, I emailed the owner of Letter.co and they did indeed stop their personalized postcard service which is quite unfortunate and have decided to focus instead on city guides. I am looking for similar services and found one that is a phone app and called Postsnap but I have yet tried their service. Thanks Kara for stopping by. Yes, a great way for postcards to stay fresh! Next trip I would send a postcard to my sister. I usually don’t see her often but letting her see the sights along with me would be great! Hi Victoria, I am sure your sister would love that. Good luck! Hope you get a chance to try this out in Thailand!! Yes, its so nice to get postcards from traveling friends and family. We will definitely be using Lettr on our upcoming RTW trip. We know it will be so much more fun for our friends and family to get something from us in their mailboxes, instead of their inboxes! I love getting real mail as well so I am sure your friends/family will love it. Envy your upcoming RTW trip! This is such a cool idea. And it doesn’t cost that much. Thanks for sharing it. You’re welcome Heidi. Thanks for stopping by! I love this service! It is totally perfect for travelers. Where was this when I needed it? Welcome KG, and hope you use this the next time you need it! It is so amazing how far communication has come. Imagine a time when mailing a letter was the only way to communicate while traveling! What a unique service, this sounds great for travelers. Would love to win. Do you care if I retweet this post? Good luck and feel free to retweet my post. The more readers, the merrier:) Thanks! This is such a great idea… I love sending postcards when I travel and I’m a member of Post Crossing, so it would be wonderful to be able to send my own pictures out to people. Thanks Michelle for stopping by! 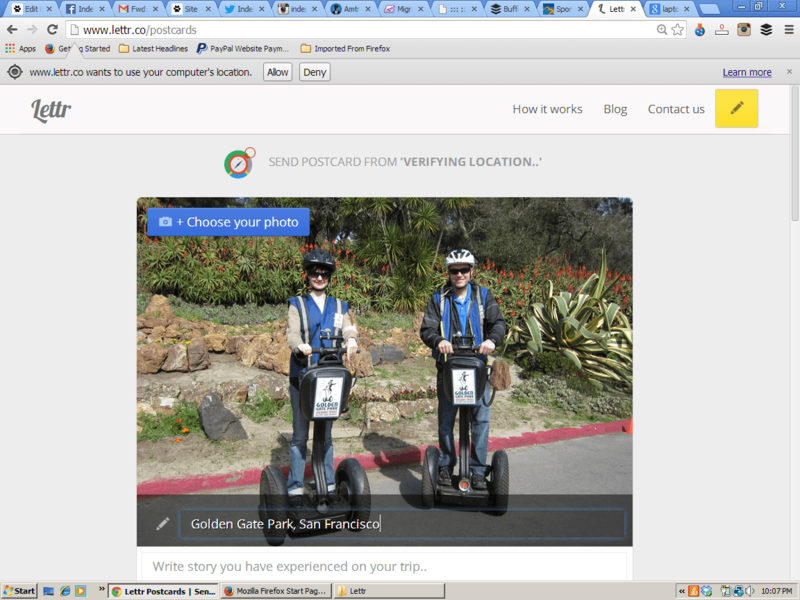 Wow, that would be great to personalize the postcards you send through Postcrossing! hello there! Lettr sounds like an amazing service. I would love to use it just from sending some from my home city as well as during traveling to my friends and parents. Thanks for providing this opportunity for your readers! You’re welcome Fong and good luck on winning the free postcards! I’ve heard of this! I do love postcards, so I might need to check it out. 🙂 I’m following Lettr on Twitter now! And I would definitely send a postcard to my fiance the next time I travel without him. 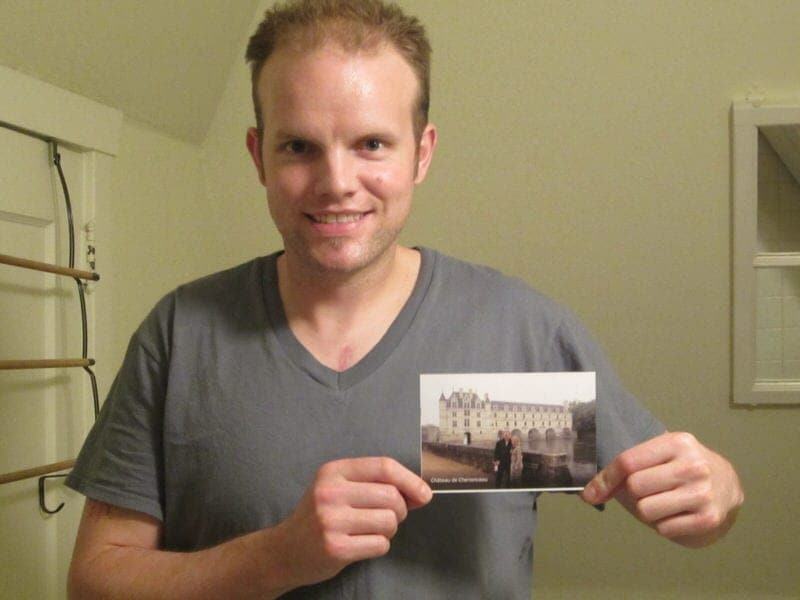 Last year when I was a traveling consultant, I sent him a postcard from every school I visited. Thanks for linking up! That is so sweet about sending the postcards to your fiance. I do the same thing with my grandmother! Good luck! On my way to Patagonia Chile. I have been looking for a service like this to welcome back my safari clients. Thanks for finding it and testing it. Hi Alan, it’s a great service when you don’t have the time to buy a postcard and figure out how to mail it while traveling. Have a great time in Patagonia (jealous!) and let’s chat whenever you get back! Oh my gosh, this is so awesome! I LOVE sending postcards when I’m traveling, but you’re totally right, sometimes they just don’t seem as personal. When I was in Paris, I would much rather have sent my brother a crazy picture of me with a gargoyle than one of the Eiffel Tower. Thanks for sharing!!! Agreed! Just getting a postcard picture of Notre Dame from you would be cool, but getting a postcard with you + a gargoyle at Notre Dame is awesome! This sounds fabulous! I would love to win the free postcards for our upcoming trips this year to Florida and Australia! I would send them to my mother, my father-in-law, my sister, and a couple of my workmates. Sounds like you have some fun vacation plans this year! Good luck! Yes, a great way to stay in touch for travelers that feels a bit more meaningful than e-mail. i would definitely send one to my younger sister in ohio – she loves getting mail! Good luck! I love getting mail too! Nicki, we do this too, especially on shorter trips when the trip is over before we’ve even managed to get a stamp or locate a post office! This definitely makes that process easier. I have to remember this! It makes sending postcards very easy. Love the ability to personalize with my own photos. Agreed! Good luck in winning the chance to try it out! I absolutely love this! Thank you so much for introducing me to it! I am a huge fan of postcards; I buy them to send to family and to keep for myself as reminders of my trip. The price is so reasonable for this service and how fun to create your own professional looking cards! I can’t wait to try it out. I would send postcards to my parents that live several states away so they can receive a personalized card from us. Would love to hear your thoughts after you use the service! Happy travels!